Chapter 11 Alzheimer’s Disease and Amyloid: Culprit or Coincidence? IV AD and Tau: A Double Act? VI Transgenic Animal Models for AD: What Have They Taught Us? Central nervous system (CNS) diseases such as Alzheimer’s disease, Parkinson’s disease, and amyotrophic lateral sclerosis affect a large number of populations worldwide for which no suitable cure is currently available. In addition, stroke, nanoparticle intoxication, diabetes, hypertension, and psychostimulant abuse either alone or in combination are capable of inducing potential brain damage. Thus, there is an urgent need to expand our knowledge to find suitable therapeutic strategies to enhance neurorepair processes in such diseases. 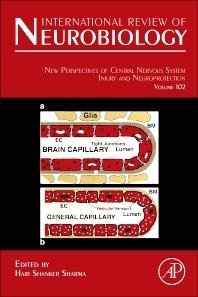 This volume presents neuroprotection and novel therapeutic strategies developed in the last 5 years by 12 world leaders in the field. The term neuroprotection means rescuing neuronal and non-neuronal cells together. The cerebral endothelium that constitutes the anatomical and physiological site of the blood-brain barrier (BBB) is one of the most important non-neural cells in the CNS. Any distortion of the BBB leads to brain diseases and restoration of the barrier results in neuroprotection. Thus, the BBB appears to be the "gateway" for neurological diseases and neurorepair. However, to treat brain tumors or infarcts, new therapeutic strategies are needed to enhance brain drug delivery using nanotechnology. In addition, apart from conventional drugs, restoration of BBB function could also be achieved by means of antibodies directed against specific proteins, neurotransmitters or exogenous supplement of neurotrophic factors. Since co-morbidity factors e.g., hypertension, diabetes, and exposure of nanoparticles could complicate the pathogenesis of neurological disorders either an enhanced dose of the drug or nanodelivery of a combination of several drugs is needed to achieve neuroprotection. This volume of International Review of Neurobiology is the first to discuss novel therapeutic strategies in situations of neurological disorders in combination with different co-morbidity factors.